Buying a swimming pool for your backyard is a worthwhile investment. It’s a great way to have fun and relax with family and friends, stay fit and healthy, and increase the value of your property. However, a pool is a major purchase. Many people don’t realise the costs that can be associated with buying and maintaining their own swimming pool. Here we take a look at the different pool costs you need to take into account, and what you can realistically expect to spend in order to have a high-quality swimming pool of your own. The shape of your backyard – does it slope, or have any unusual angles to take into account? The optional extras and accessories you choose. These are all elements that affect the pool price. People usually think that the cost to build a plunge pool is a fragment of that of a lap pool. 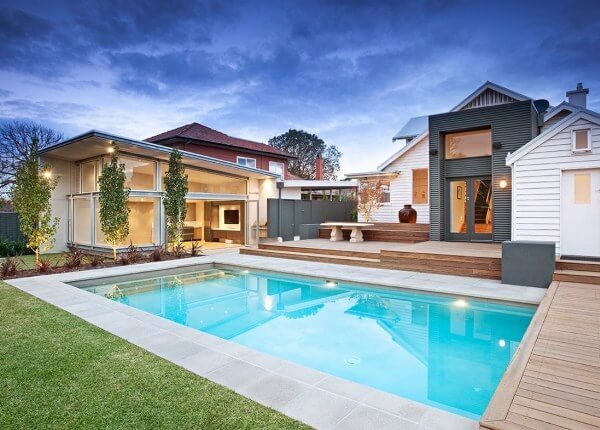 However, if other factors remain constant (the same backyard, pool type, technologies and accessories), the difference between the price of a plunge pool and lap pool is not that significant. Talking to a pool company before deciding if to go for a plunge pool or a larger pool and/or getting pool quotes for different sizes may help you to get a better idea of the pool price. Similarly, the type of terrain affects pool costs significantly. On sloping sites, a pool will be typically built partially above the ground. It does not automatically mean that the inground pool cost will be lower than the one built above the ground. It’s advisable to consult a professional pool builder to help you make the important decision about the right pool for you. There are three main materials used for building swimming pools. Each has advantages and disadvantages. Which you choose will depend on your own circumstances and the conditions of your backyard. 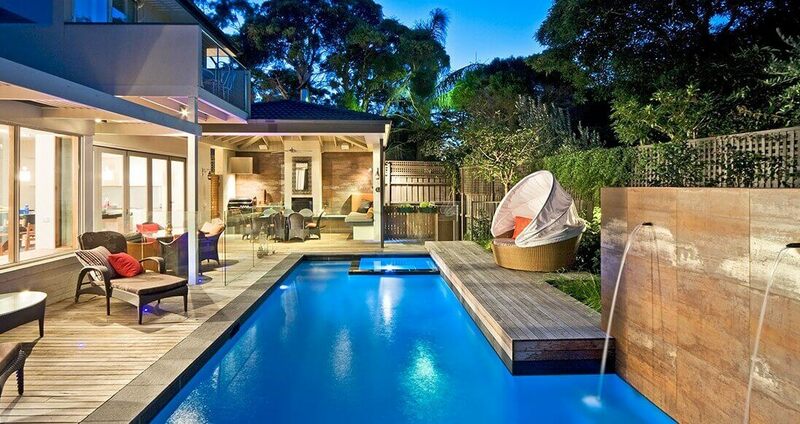 Concrete is the most popular material used for building pools in Australia. It is extremely strong and durable, guaranteeing that you can continue to enjoy your pool for a long time to come. It is also a tried and trusted material that has been used to build both residential and commercial pools all over Australia for many years. Concrete pools can be built in practically any shape and size. This is a major advantage if you want a truly bespoke option tailored to suit your own tastes and the design of your property. However, concrete pools take longer to build due to their bespoke nature and the materials used. This means they initially cost more than other options due to the additional work involved. For a family-sized concrete pool, you can expect to pay $60,000 – $100,000. Fibreglass pools are becoming more popular and are cheaper than concrete. However, they are not suitable for all yards as they tend to come in off-the-shelf designs, which can’t easily be tailored to suit your individual needs. A professionally built fibreglass pool will cost between $40,000 and $60,000. Some manufacturers do offer DIY fibreglass pools which start from as little as $15,000, but these are not recommended unless you really know what you’re doing. Health, safety and durability are paramount in pool building, and poor installation can end up costing you a lot of money in the long run. We strongly advise that you have your pool installed by a licensed pool builder. Vinyl-liner pools tend to be the cheapest option, starting at around $10,000. However, whether you choose an above-ground prefabricated vinyl-liner pool or the in-ground option, they require a great deal of maintenance. There are also strict rules about their installation, which can add to the cost. In addition, vinyl-liner is not a particularly strong material, so there’s a high chance that your pool will need replacing after a few years of use. These factors mean that in the long run, a vinyl-liner pool is not a particularly cost-effective option. What Do Pool Building Costs Include? The initial cost of your pool has to cover a wide range of different elements. For a start, a pool builder will work closely with you to create the design for your pool, ensuring that it’s suitable for your property and meets your leisure needs and aesthetic tastes. Following this, the pool builder has to acquire the correct permits and insurance to make sure your pool is being built legally and safely. The materials used to build your pool, such as concrete and steel, are also covered in the initial cost, as is the workmanship of actually building your pool and performing all the required safety checks before handing it over to you. This is why, although the initial cost of a pool may seem expensive, it is actually quite a bargain when you think about the entire package you’re getting! When choosing your pool, it’s important to consider not just the initial spend, but how much it’s going to cost you to maintain your pool in the months and years ahead. All pools need to be maintained regularly to keep them free of algae and bacteria, ensuring they remain safe and healthy for you and your loved ones to use. Your chosen filtration system – how much does it cost to run and service? Cleaning costs – do you choose a self-cleaning system, a robotic cleaner or will you clean your pool manually? Aesthetic costs – these could include elements such as pool lighting, water features, fencing and a number of other options to suit your tastes. As pools are often as individual as their owners, it’s impossible to give a ball-park figure of your maintenance costs. These will need to be discussed in detail with your pool builder when you’re choosing the options for your pool. The cost of your swimming pool will depend entirely on the options you select. These must suit your own tastes and usage needs, as well as being suitable for the conditions in your backyard. Whichever pool you choose, it’s a worthwhile investment which will bring you a great deal of enjoyment for many years to come. If you’d like to know more about purchasing your own swimming pool, or to discuss the various options available to you, please contact us. We’ll be happy to help. If you like the pool installations we accomplished, talk to us about the cost of your own pool. We are happy to prepare a quote for you and explain all the items and factors affecting the pool price.